In part two of this series, learn what happens when we re-align with God’s plan for our lives. Dr. Shante also breaks down how to avoid getting trapped, losing ground, and damaging our calling. Normally PTSD refers to Post Traumatic Stress Disorder, but in this episode, PTSD refers to your “Past Triggering Self Destruction”. Learn how to face your demons and end self-sabotage, once and for all in this episode. Relationships can be complicated. Our relationship with God is no different. In this episode, Dr. Shante shares what it means to be lost as a believer and how to find your way back. Welcome to Season Six! Dr. Shante is excited to bring you the first capsule season of the podcast. What this means is that the entire season is pre-recorded and will be available within days instead of weeks or months. In this brief intro, Dr. Shante breaks down what you can expect in Season 6. 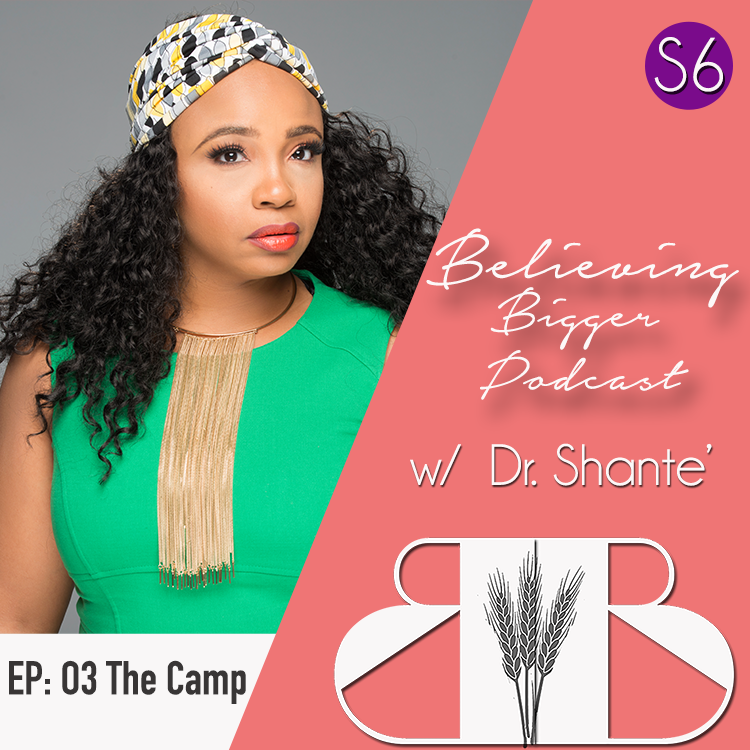 From the outset, Dr. Shante committed to doing Five Seasons of the podcast. In this episode, she shares her struggles with this season and renders her decision on whether or not Believing Bigger podcast will continue for another season. “I just wanna know baby, if what we had was good, how come you don’t call me anymore”? Believe it or not, this is the question that God is asking many believers today. The strength of our platform is directly correlated to the strength of our prayer lives. In this episode, Dr. Shante breaks down the correlation and what we need to do to strengthen our signal to God. In Matthew Chapter 5 Jesus commissions believers to be the Salt of the Earth. But what does that mean? He also warns of losing our “saltiness”. How is this possible? In this episode, Dr. Shante explains the impact and potential that Believers have and illustrates the ways in which we can become ineffective. It’s easy to be enticed by the bright lights, fame and fortune of Hollywood, but all that glitters is not gold. In this episode, Dr. Shante shares her experience attending a star-studded film festival, what she discovered on an unexpected adventure and why what we’re chasing is so elusive. Even the best of us experience seasons of dryness. These moments are characterized by a longing for God to show up on our behalf and bless us. But when God goes silent, nothing is working, or we don’t have the same efficacy that we use to have, it can create a season of doubt and discouragement. In this episode, Dr. Shante teaches how to get out of your drought and back into a season of productivity.